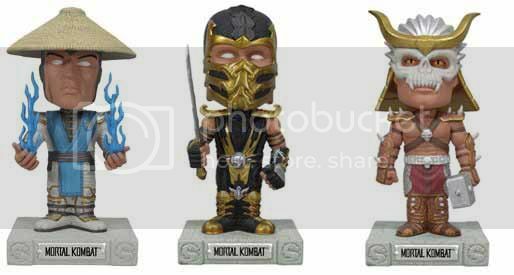 Mortal Kombat Bobbleheads - Wacky Wobbler? I never really liked bobbleheads, there's something about 'em that creeps me out. Kind of feels like they're mocking me every time they shake their heads. Now I may have to reconsider all that by the time these Mortal Kombat Bobbleheads hit the market. For now Funko's going for 3 character designs which I'm sure fans of Scorpion, Rayden and Shao Khan will love to have. I hope the make Fatality versions of these since that would probably fly off the shelves faster than a decapitated arm. You can pre-order these at the source link below for a hair below USD 13.00 with a ship date around August.